» Which spring should I buy for my garage door? » Should I buy the same springs that were on my garage door before? » What should I do if I want to buy torsion springs that are different than my current springs, or what if I do not know what my current spring is? » Should I buy longer life torsion springs? » What is the difference between right and left wind springs? » Should I convert from one torsion spring to two springs? » Should I replace both torsion springs on my double car garage door? » Should I replace both cables? » Do torsion springs come with or without cones? » What do I need to buy with my garage door springs? » What do I need to know about shipping and returns? » What are the dimensions of my current torsion spring? » What do I do if my current spring does not match my door weight? » What do I do if my current springs are different dimensions? » How do I convert from old Crawford garage door hardware? » How do I modify my garage door so it rises closer to the ceiling? » How do I weigh my garage door? » How do I measure my garage door springs? » How do I determine the track radius? » How do I replace my garage door torsion springs? Which springs should I order? Many people buy the same springs that are already on their garage door. Go to our Should I buy the same spring that was on my garage door before? FAQ to find out whether you should purchase the same spring you already had. If you want to get different springs, go to our What should I do if I want to buy a different spring? FAQ to determine which spring you should get. If you know which spring you want to purchase, find your spring price, then place an order with DDM Garage Doors. Should I buy the same spring that was on my garage door before? 1. Did your garage door springs work before? If you ran your door manually before it was broken, was it easy to open and close? If so, it was balanced and your old springs were the correct type. In this case, it should not be necessary to weigh the door unless you want to confirm that you have the correct springs. On the other hand, if the door felt heavy, it may be that the springs were not strong enough. 2. 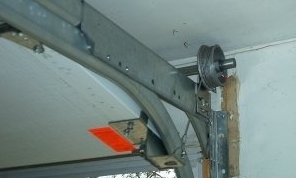 Is the torsion spring lift correct for the weight of the garage door? Compare the door weight with the existing spring lift. 1. Weigh the garage door. 2. Measure your current torsion spring. Go to our Torsion Spring page to find more information about inside diameter, wire size, length, and lift. 4. Locate your spring in the Database. Note: Database is only for standard 4" diameter cable drums. Find the column for the lift within your track radius. 5. Compare the lift with the weight of your door. If it is within 10 pounds for the total weight of both springs, the current springs should balance your door when wound correctly. You may purchase the same springs you currently have. If your springs do not appear in the database, they may be overstressed. Call us for a recommended replacement spring in this case. 3. Is the cycle life right for the needs of your door? Compare the cycle life of the existing spring with the frequency of door usage, condition of the door, and how long you plan to remain at that location. 1. Measure your current torsion spring. Go to our Torsion Spring page to find more information about inside diameter, wire size, length, and lift. 2. Determine the track radius. 3. Locate your spring in the Database. Note: Database is only for standard 4" cable drums. Find the column for the number of cycles within the correct track radius. 4. Make an informed decision. The industry minimum standard for garage door torsion springs is 10,000 cycles. If you want more cycles than your current spring, you can look in the compatible replacement list. Higher cycle springs last longer. If your garage door springs have lasted less than five years, or if you plan to live where you are for many years, you may want to try the extra long life torsion springs. By using larger springs you can, in most cases, quadruple your spring life while only doubling the cost of the springs. You will also avoid extra work down the road. The industry standard is 10-15,000 cycles for new doors. By increasing the spring wire several sizes you can increase your spring life to over 100,000 cycles with the extra long life garage door springs. For springs weighing over 20 pounds each we recommend adding extra shaft support brackets, pictured below to the left of the torsion spring. These sell for $6.00 each plus shipping. The largest wire used on standard 1 �" and 2" plugs is .295. High cycle springs for heavier doors weighing over 300 pounds may need larger inside diameters, plugs and additional spring and support brackets. Please call for quotes if needed. If you have decided to purchase your current spring, see Ordering Information. What should I do if I want to buy a different spring than my current spring, or I am not sure what my current spring is? If you wish, you may find your own suitable replacement spring. 2. Go to the Find My Spring Database™. List the torsion springs by lift, and find the springs whose lifts match the weight of your door. If you have a double car door, make sure to divide the weight of the door in half to find the lift of one of the springs. 3. Place an order with us. Have us help you find a suitable replacement spring. Provide the manufacturer and model number of the door. Look for this information on the ends of the sections. It is usually easier to find by opening the door. Sometimes it can be found on the face of the sections, or on the tracks, lock, struts, or hinges. Provide also the door width, height and track radius. Measure the width and height of your door. Most garage doors are 8', 9' or 16' wide and 7' high. Many are 8' high, and many others are 6'6" or 7'6" high, and anywhere in between. Most doors are either wood or steel. If you're not sure, use a magnet. Knowing the size and type of door you have will help us catch obvious errors in original installation, or in your weighing of the door or measuring of the springs. 2. E-mail us pictures to the address below. Often we can measure the springs for you. A high quality picture like the one below should suffice. It is best if you take the picture from the center of the spring. Let us know if the unbroken spring is wound or unwound. Pictures of the tracks, door and anything with writing on it would also help us identify the model and confirm that your door has the correct torsion springs. If your garage door springs have lasted less than five years, or if you plan to live where you are for many years, you may want to try the extra long life torsion springs. By using larger springs you can, in most cases, quadruple your spring life while only doubling the cost of the springs. You will also avoid extra work down the road. The industry standard is 10-15,000 cycles for new doors. By increasing the spring wire several sizes you can increase your spring life to over 100,000 cycles with the extra long life springs. What is the difference between right and left wind springs? On most garage doors, the spring on the left side of the center support bracket has a winding cone with red paint on it. This is a right wind spring. The spring on the right side of the bracket usually has black paint on the winding cone. This is a left wind spring. If you have only one spring on your garage door just remember that if the spring is on the left side of the bracket it is right wind, and if it is on the right of the bracket, it is left wind. The only exception to this is if you have a door with outside lift bottom fixtures and the cables come off the fronts of the drums as pictured below. On these the right wind spring will usually be on the right side of the bracket, and the left wind spring will be on the left side of the bracket. One garage door spring or two? If your door has only one spring which is made of .250 wire or larger, it may be advisable to substitute one larger spring with two smaller springs. The cost usually runs $5-10 more, but it may prevent serious problems in the future with cables breaking or peeling off the drums, and steel sections getting damaged. The following FAQ should help you understand the problem and determine if it would be better to convert from one to two garage door springs. For a more detailed look at the problems of only having one torsion spring, see our One Torsion Spring or Two? page. Should I replace both springs on my double car garage door? We normally recommend replacing both torsion springs because they normally wear at the same rate, and they usually break within six months of each other. They wear out like car tires, only you can't tell from looking at them when they are ready to break. Garage door springs break because every time the door opens and closes, the spring wire bends a little. You may have broken a paper clip or a piece of wire before by bending it back and forth. This is what happens to torsion springs. If the spring that is not broken has been replaced in the previous year or two, we do not recommend replacing it. If the other spring looks like it has been replaced, but no one knows, I usually ask the customer to decide. Newer springs usually look black. Older springs have an orange tint from rust. Should I replace both cables? Unlike springs, cables do not normally wear at the same rate. Some cables rust at the bottom from exposure to salt only on one side of the door. Many cables fray because of a rough spot on only one of the cable drums. When we send out our cables to you, there is a good chance that our cables will be slightly longer or shorter than yours. If you replace a cable with one that is a slightly different length, you run the risk of having the door not balance. Therefore, to save you from the possibility of the extra hassle of trying to level your door, we suggest that you replace both cables. Do torsion springs come with or without cones? The prices for residential torsion springs from the Find My Spring Database™ include cones on each end. To determine the price without cones installed for these springs, click the "calculate" link in the far right column. The prices for commercial torsion springs do not come with cones. If you want cones installed, add the price for the cones to the price of the spring, and add 10% to this combined cost for the labor. For instructions for replacing cones go to our Torsion Spring Cone Replacement tutorial. What do I need to buy with my garage door springs? Winding Bars. In order to wind your new torsion springs, you will need winding bars. If you order the springs with the cones installed and the inside diameter is up to 2-5/8", you will need 1/2" diameter winding bars. If you are reusing your existing cones with an inside diameter up to 2-5/8", the necessary diameter will usually be 1/2" as well. There are, however, some cones that require bars that are 3/8" to 5/8" in diameter). Most residential springs can be wound with bars that are 18" long. Springs (or duplex/triplex sets) that lift 200-300 lbs each should be wound with 24" bars. If the springs each lift more than 300 lbs, you will probably want 36" bars. Winding bar prices vary based on the length and diameter of the bar. Hexagonal bars are helpful for working on doors because they tend to not roll when you set them down. Winding bars are often shipped separately from the torsion springs if the springs are sent from one of our suppliers. Another option is to purchase a steel rod at a hardware store and cut it in half. Cables. We don't recommend replacing the cables unless they are broken, frayed, rusty or gnarled. We do, however, suggest that you replace both cables if one of them is in bad shape. Cable prices vary based on the door height and the cable diameter. Additional Parts. To find other parts for your door, please browse our parts catalog. What do I need to know about shipping and returns? Shipping. Garage door springs are shipped from several suppliers around the country to minimize shipping time and cost. Torsion springs ordered by 9:30 AM CST are normally shipped same day from any of six suppliers around the country, and springs ordered by 4 PM CT are normally shipped the same day from West Chicago. Shipping and handling costs for residential springs to date usually have run $12-17 for one spring and $15-23 for two standard springs. Single springs 26" or shorter are shipped anywhere in the 48 states for $9.85. Shipping may be more for longer life torsion springs and for wooden garage door springs depending on your location. Returns. The more common sizes of torsion springs may be returned if you pay the shipping to return the spring to West Chicago. We will then either credit your invoice or send different springs and charge or credit you for the difference. Before ordering, it is advisable to ask if your spring is a standard size. If you are ready to buy garage door springs, see Ordering Information. What are the dimensions of my current torsion spring? Every torsion spring has four dimensions: length, wire size, inside diameter, and wind. If you operated your garage door manually before your spring broke, it should have been fairly easy to open and close. If that's the case, you can measure your old springs and then consider longer life options. If your garage door did not operate well before the spring broke, you may want to base your new springs off of your door weight. For more information, view our Standard Torsion Spring page. What do I do if my current spring does not match my door weight? If you have measured your old springs and their lift is more 10 lbs off of your garage door weight, it can be difficult to decide what to do. If you have two or more springs, did you measure them all? About 30% of manufacturers and installers use springs with different dimensions based on their inventory. If your springs have different dimensions, enter each one in the Find My Spring Database™ and add the lift of each spring together. This should match the weight of your door. What is your track radius? The Find My Spring Database has columns for both 12" and 15" radius tracks. You'll need to look at the correct column. What is your cable drum diameter? If the part of the cable drum that is closest to the torsion springs is not 4" in diameter, our Find My Spring Database™ will not give you the proper lift. Note: A 4" drum will have a 12.6" circumference on the narrowest part of the drum on which most of the cable wraps. It will also have part numbers such as 400-8, WD-4, or OMI-8 e;mbossed on the drums. If you have a high lift garage door, or if you do not have a 4"-diameter cable drum, contact us to check how much weight your springs should be able to lift. Did you use a micrometer or caliper to measure the wire size? These tend to be less accurate. Do a 20-coil count and a 10-coil count. See our How to Measure Torsion Springs page for more information. When you did the 20- and 10-coil counts, did you pull the tape measure tight? The end of the tape measure is slotted to allow for the thickness of the metal. When you measure the length of a board, you hook the end over the edge of the table. When you measure the distance between two boards, you press the end of the tape measure against one of the boards. The slotted end allows for more accurate measurements. Be sure you pull on the tape when measuring your springs. When you did the 20- and 10-coil counts, did you count the number of coils correctly? If your two measurements do not give the same wire size, you did not count the coils correctly. Re-measure. Try putting a penny between two coils. Start counting to the right. When you reach 20, put another penny between the 20th and 21st coils. Do the same for the 10-coil count. Also, make sure that there are not gaps between the coils of the spring. When you did the 20- and 10-coil counts, did you measure to the nearest 1/16"? If it looks like it's about 4-1/2" on the 20-coil count, is it 4-1/2"? Or is it 4-3/8"? Or is it 4-5/8"? This makes a big difference. In carpentry, the last 1/16" does not matter. In torsion springs, it does. Did you use a digital scale to weigh your door? Use an analog scale. Most digital scales are designed to give you a number that you will still be able to read once you step off the scale. When you shake the door and check the rollers to make sure that nothing is stuck, a digital scale will not account for the difference. Is the inside diameter correct? Did you measure it or read a cone? Since measuring around the shaft can be difficult, look at the winding and stationary cones again. If you still cannot reconcile the two measurements, do you trust your spring measurements? Or do you trust your door weight? Which ever you trust more, go with that measurement. Generally speaking, we suggest that you rely on your door weight from an analog scale as it is possible that your springs were not properly matched with your door weight. What do I do if my current springs are different dimensions? Check out our Using Torsion Springs with Different Lifts page. We recommend using matched springs rather than springs with different dimensions. If you want us to automatically calculate the matched springs for you, fill out the form on the bottom of the Using Torsion Springs with Different Lifts page. If you prefer to perform the calculations yourself, read on to see how you can find a pair of matched springs that will work on your garage door. If you have two springs with an inside diameter of 1-3/4", 2" or 2-1/4", enter the spring information for each spring in our Find My Spring Database™. Based on your track radius, find the lift for each spring. Add these lifts together. Divide the total lift by two. This is the amount of weight that each spring should lift. If you go back to the database index, you can "List Torsion Springs by Lift". Click on the inside diameter of your springs for your door height. If you have different inside diameters, you can pick either one. The page that comes up shows springs in 5-pound lift increments. Scroll down the page to the lift that each spring needs to have. You will see a lot of options for springs with various cycles. As long as each spring in the pair that you pick is within 5 pounds of the lift that you calculated, the new springs should work for your door. Here's an example. Let's say that the combined lift of two 1-3/4" inside diameter springs is 243 lbs for an 8' door. I want each new spring to weigh half that amount, or 121.5 lbs. Even though springs that lift 116.5 to 126.5 lbs will work, I want something that is fairly close to 121.5 lbs. When I look up this information, I find that I could get 33.5 inches of .234 (wire size) that lifts exactly 121.5 lbs. On 12" radius tracks, this will only get 15,000 cycles. If I wanted a lot more life out of my springs, I could look down the list and see 58.25 inches of .262 (wire size) that lifts 120 lbs. The spring gets 72,000 cycles (almost 5 times more) for less then twice the cost. If I like this option, I can purchase this pair of springs which will work well with my door. If you have an inside diameter or door height that is not listed, contact us for more information. 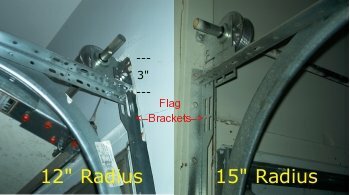 If you have an older Crawford or BarCol garage door with larger cable drums, you may want to standardize your hardware. The extra parts run an extra $40-50 with shipping and handling, not including the cost of a one inch shaft you may need to replace if you have an older BarCol 1 1/16" shaft. For detailed instructions on converting EZ-Set and Crawford torsion springs, see our torsion spring tutorials. If you are thinking of modifying your garage door so it rises closer to the ceiling, review our diy instructions for garage door high lift conversion and then get a quote for a custom garage door high-lift kit including the necessary hardware, drums, cables, and springs. There are three ways to do this. One is to use a level to measure from the junction of the vertical and horizontal tracks to the bottom of the straight portion of the horizontal track as pictured on the right. A second way is to measure from the floor to the bottom of the straight portion of the horizontal track as pictured on the left. 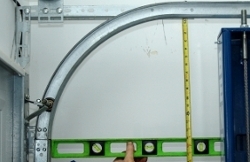 On 7-foot high garage doors the measurement will be about 7'4" for a 12" radius track or 7'7" for a 15" radius track. On 8-foot high garage doors the measurement will be 8'4" for a 12" radius track and 8'7" for a 15" radius track. Floor variations or horizontal tracks that are not level may vary these dimensions an inch or more. The third way to determine your track radius is to visually check your tracks as pictured on the right. On the left door notice that with 12" radius tracks the horizontal angle connects to the vertical flag bracket 3" below the top of the flag bracket. On 15" radius tracks, however, the horizontal track angle connects to the top of the vertical flag bracket angle. The more information you gather, the better we can help you get the torsion springs you need.